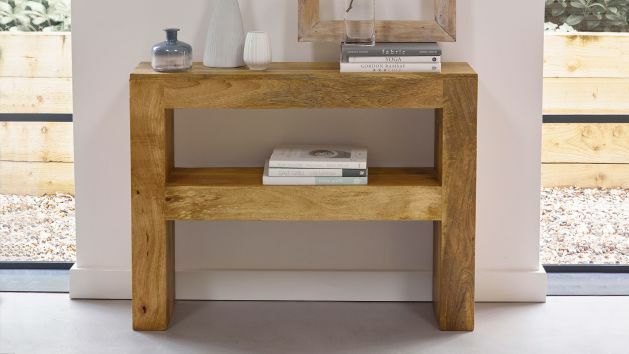 Browse our stunning solid oak, mango, and painted console tables, available in many different designs and finishes to create your perfect entryway. A hallway table is often the first piece of furniture you see when entering your home, greeting guests as they walk into your front door. These consoles tables, designed to sit close against the wall in a mudroom or entry, are an ideal way to create a fresh, clean and clutter-free first impression in any guest. With drawers perfect for storing keys or mail, and lower shelves ideal for keeping boots, umbrellas, or other hallway clutter organised, a hallway table can create a stylish first impression of your home. At Oak Furniture Land you'll find not only the best oak console tables but also stunning pieces in 100% solid mango or painted hardwood, so that you can always find your favourite style knowing that it’s made to our standards, resting assured that it will be durable, look great, and truly stand the test of time. And if your entry is small, why not consider pairing it with one of our fantastic matching hallway mirrors to create the illusion of a bigger space? Browse our wide range of console and hallway tables today. And, of course, don't forget about our great delivery options, free as standard.